The Free State (Afrikaans: Vrystaat, Sotho: Foreistata; before 1995, the Orange Free State) is a province of South Africa. Its capital is Bloemfontein, which is also South Africa's judicial capital. Its historical origins lie in the Orange Free State Boer republic and later Orange Free State Province. The current borders of the province date from 1994 when the Bantustans were abolished and reincorporated into South Africa. It is also the only one of the four original provinces of South Africa not to undergo border changes, excluding the reincorporation of Bantustans. The premier of Free State as of 2009 was Ace Magashule of the African National Congress. 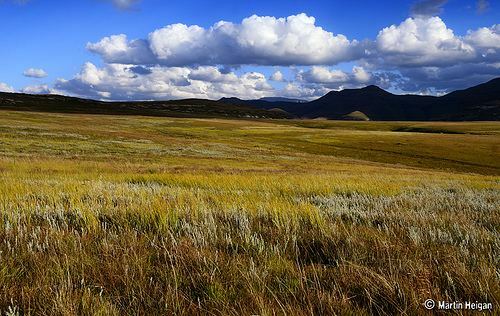 The Free State is situated on a succession of flat grassy plains sprinkled with pastureland, resting on a general elevation of 3,800 feet only broken by the occasional hill or kopje. The rich soil and pleasant climate allow for a thriving agricultural industry. With more than 30,000 farms, which produce over 70% of the country's grain, it is known locally as South Africa's breadbasket. It is traversed by the northwesterly line of equal latitude and longitude. The Free State is divided into one metropolitan municipality and four district municipalities. The district municipalities are in turn divided into nineteen local municipalities. Free state has many public and private hospitals,some of them are, Bloemfontein Medi-clinic, Bethlehem Medi-clinic, Welkom Medi-clinic and many more. Agriculture dominates the Free State landscape, with cultivated land covering 32,000 square kilometres, and natural veld and grazing a further 87,000 square kilometres of the province. It is also South Africa's leader in the production of biofuels, or fuel from agricultural crops, with a number of ethanol plants under construction in the grain-producing western region. South Africa is one of the top ten Maize producers in the world (12,365,000 tons as of 2013) whereby all of the crops come from the Free State. The Free State is well known for its Mielielande (corn-fields). Field crops yield almost two-thirds of the gross agricultural income of the province. Animal products contribute a further 30%, with the balance generated by horticulture. Ninety percent of the country's cherry crop is produced in the Ficksburg district, which is also home to the country's two largest asparagus canning factories. Soya, sorghum, sunflowers and wheat are cultivated in the eastern Free State, where farmers specialise in seed production. About 40% of the country's potato yield comes from the province's high-lying areas. The Free State's advantage in floriculture is the opposing seasons of the southern and northern hemispheres. The province exports about 1.2 million tons of cut flowers a year. The Free State is also rich in mineral wealth, gold representing 20% of the world's total gold production. Mining is the province's major employer. The province has 12 gold mines, producing 30% of South Africa's output and making it the fifth-largest producer of gold in the world. The Harmony Gold Refinery and Rand Refinery are the only two gold refineries in South Africa. Bituminous coal is also mined, and converted to petrochemicals at Sasolburg. The Free State also produces high-quality diamonds from its kimberlite pipes and fissures, and the country's largest deposit of bentonite is found in the Koppies district. Since 1989, the Free State economy has moved from dependence on primary sectors such as mining and agriculture to an economy increasingly oriented towards manufacturing and export. Some 14% of the province's manufacturing is classified as being in high-technology industries – the highest of all provincial economies. The northern Free State's chemicals sector is one of the most important in the southern hemisphere. Petrochemicals company Sasol, based in the town of Sasolburg, is a world leader in the production of fuels, waxes, chemicals and low-cost feedstock from coal. In the northeastern Free State, nestled in the rolling foothills of the Maluti mountains, the Golden Gate Highlands National Park is the province's prime tourist attraction. The park gets its name from the brilliant shades of gold cast by the sun on the spectacular sandstone cliffs, especially the imposing Brandwag or Sentinel Rock, which keeps vigil over the park. The sandstone of this region has been used for the lovely dressed-stone buildings found on the Eastern Highlands, while decoratively painted Sotho houses dot the grasslands. Some of South Africa's most valued San (Bushman) rock art is found in the Free State, particularly in the regions around Clarens, Bethlehem, Ficksburg, Ladybrand and Wepener.